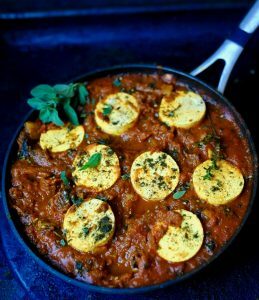 Vegan Shakshuka: a one pan spicy, smokey, tomato stew usually topped with poached eggs, was first brought to Israel in the 1950s by the Tunisian Jews, where it became a favorite for breakfast, lunch and dinner. I changed out tofu for the eggs where they soak up the aromatic stew and become little cushions of flavor. My feet ached with an insistent throb like the beat of the music I had been dancing to minutes before. I slipped them from my sandals and rubbed my arches as I waited in the line of suddenly sleepy night revelers. The sky above the minaret shone a dusky lavender. Soon the sun would peak into our midst and illuminate our shadowed eyes, mussed hair and smudged smiles. “Come on” he said as he reached for my arm to playfully drag me out on the dance floor. Quick as a snake my dance partner pulled the lit cigarette from his mouth and put it out on the young man’s bare arm. “The lady said no.” he intoned laconically in his heavy accent. The young man yelped and jumped away. 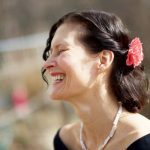 As a new song began, he tipped his fedora capped head and asked me to dance. We danced until the bottom of my feet were raw and my voice hoarse from singing made up lyrics to foreign songs. My Kibbutz friends dragged me from the club and we set out to Jaffa for a quick breakfast before heading back home. We wend our way through alleys that smelled of sea salt, urine and freshly baking bread until we reached a little hole in the wall restaurant and placed our Shakshuka orders. The smell arrived before our food, filling the alley and making us fairly mad with anticipation. Moments before we had stood like soldiers at the end of night watch, leaning lazily against the stone wall, now we talked animatedly with our fellows in line until our food arrived. 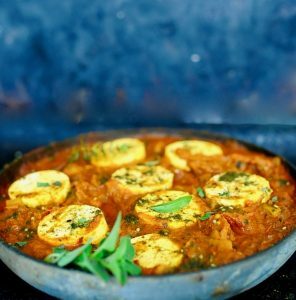 Bowls of brick-red Shakshuka arrived, puddled with olive oil, strewn with fresh herbs and decorated with soft poached eggs. The perfect end to the night. I urge you top your shakshuka with both Labneh and Za’atar. 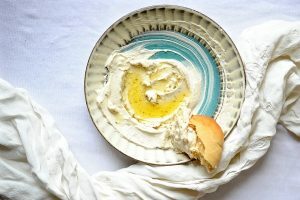 Labneh is a tangy, Levantine cheese spread that can be served as a dip with pita bread or smeared on a toasted bagel. 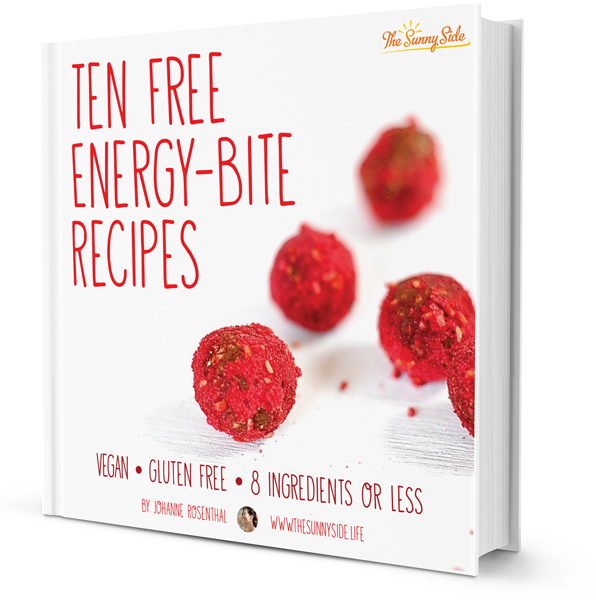 Here is my Vegan recipe. 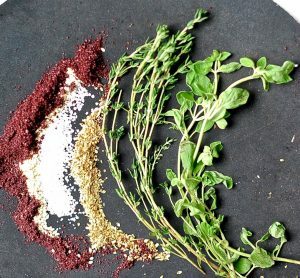 Za’atar is both an herb (hyssop) and a condiment that is used across the middle east. People dip their pita in it, throw it on their grilled veggies and sprinkle it on their labneh. Here is my recipe. Shakshuka is the ultimate savory slightly spicy, one pan brunch dish that will impress the heck out of your friends. 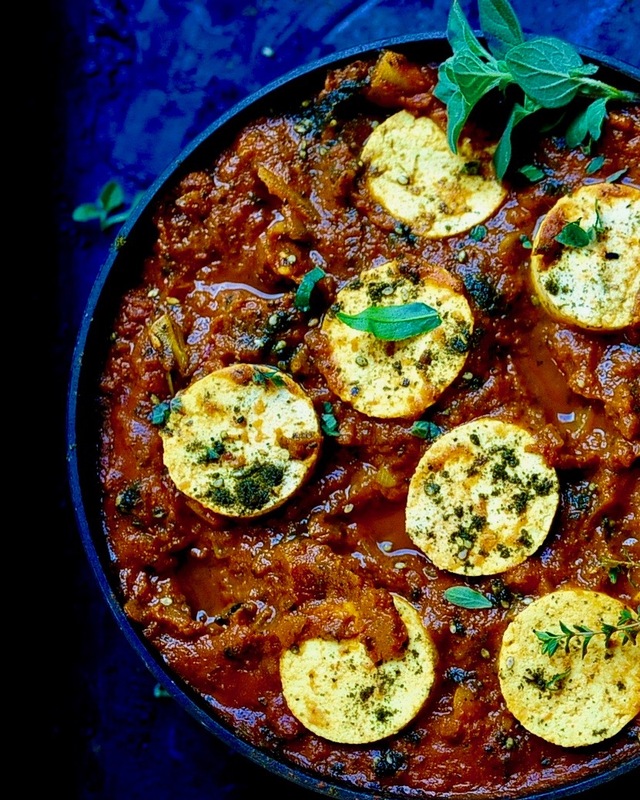 Serve it with soft flat bread and vegan labneh or vegan yoghurt. 2 tsp Za'atar boughten or made from my recipe. 1/2 cup labneh, or vegan unsweetened yoghurt. Slice the tofu into two pieces lengthwise. Pat them dry, and cube into two inch cubes or get fancy and use a cookie cutter like I did here to make them fancy. Heat a large sauté pan over medium heat with the olive oil, tomato paste, smoked paprika, harissa, onion, red peppers, garlic, sugar, cumin and salt. Sauce until the peppers are soft 6-8 minutes. Stir frequently. Add the tomatoes and simmer ten minutes until the tomatoes have surrendered and became a sauce. Place each cup or round of tofu into the sauce, pressing down so just the tops show and the rest is submerged in the sauce. Simmer for ten more minutes. Strew the Za'atar across the top and serve with flat bread and Labneh. What a lovely memory of dancing all night! Good morning I am going through the recipes I have stumbled across over the past year when browsing the web. I wanted to find something different to cook this week and found your recipe again. I’m not vegan, but enjoy all types of food and your dish looks and sounds delightful. I am unfamiliar with a couple of things in the ingredient list. Thank you for providing a link to your recipe for the za’star. That is definitely something new to me, but I am very familiar and have all ingredients to make it except for sumac. Can you suggest a suitable substitute for that? I’m not sure where I’d find that near me. 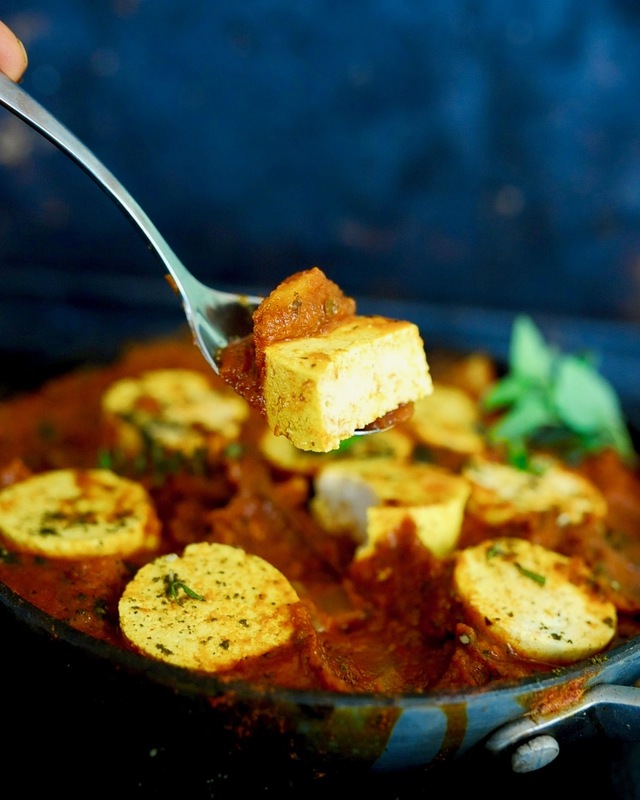 Also…great idea for how you cut the tofu! I’m so glad you are enticed by this recipe. Sumac is has a “zingy” sour flavor. I would replace it with either lemon zest and juice, or pomegranate molasses, or tamarind paste. I hope this helps.